We always assume we’ll have a rifle when hunting, but in a survival situation, we may be lucky to have a pocket knife. A rifle is the standard, contemporary tool or weapon for almost any hunting situation. It’s a highly sophisticated weapon customized with scopes and by caliber for a variety of game species and sizes. But hunting without a rifle is a whole different story and it’s not as hard as it sounds. Our primitive ancestors successfully hunted for thousands of years without the firepower we typically take into the fields and forests when hunting. They often hunted in groups, but solitary hunters also found great success, although smaller game tended to be the target of the lone hunter. Primitive hunters left nothing to chance and would often carry multiple weapon types to take down and kill game. Some of these weapons could be used at a distance to cripple or incapacitate an animal long enough for a hunter to close in and finish it off. There were also middle-distance weapons and close quarter weapons. These animals may not fall into the trophy class, but all provided valuable sources of protein and were not only easy to hunt, but easy to prepare and cook. In a survival situation, you’ll probably want to pursue a similar strategy and go after smaller scale targets not only for your own safety, but for the relative ease of hunting them. Assuming you’ve been able to start a fire, there are some easy ways to cook your wild game without the usual utensils. The easiest technique is a Japanese style of cooking known as “Yakitori.” This consists or two rows of rocks running parallel to each other with a gap of 3 to 6 inches between the row. The height of the rocks depends on the size of the cut of meat. 3 to 6 inches high works for smaller cuts, but larger rocks and more coals can be used for cooking larger cuts of game. Hot coals are dropped into the gap and the game is skewered onto two sticks zig-zagged through the meat on either side. The sticks are then suspended on the rocks with the meat exposed to the coals and the ends of the bare sticks protected by the rocks. The two sticks allow you to turn the meat over the coals without the meat spinning like it would on a single stick. You can also opt for a large spit-style of cooking which involves suspending the impaled game or fish over coals on a thick, green branch that you need to rotate frequently. The Chinese support their larger spit-branches on two logs parallel to the coals and the spit is rolled on the logs to keep the meat from burning. You could also zig-zag two large branches into both sides of a large piece of game and insert them into the ground next to a burning fire with the meat side, and later the bone side, facing the fire. In this instance, the radiant heat from the fire cooks the meat without the meat getting exposed directly to the flames. This is a style of cooking popular in the Patagonian region of South-America. What’s great about these techniques is you can cook a variety of game and even some vegetables at the same time over the same fire and manage the cooking process easily. It also lets you eat as you go. When something is done, you take a bite and let the raw portions continue to cook. Forget about the salt and pepper. There are some wild alternatives for flavoring wild game in the wilderness. The red berries from the flower tops of the Red Sumac tree have a peppery, citrus flavor that’s often used in the Middle-East to flavor kebabs and roasted meats. Crushed Ramps or wild onions and the crushed flowers of Garlic Weed can also offer some flavor accents especially for gamier cuts like Possum and Racoon. A mash of berries like wild blackberries or mulberries can add a bit of flavor as well when used as a rub. We’re going to cover a range of types and styles of primitive weapons and categorized them by their use relative to distance and the hunt. It’s unlikely and unnecessary to carry all of these weapons, but you might want to combine a few depending on the location and the game you are hunting. But first, a few definitions are in order. They may seem to need no definition, but there are a few considerations for rock selection for primitive hunting. For one, you’ll want to collect more than a few. You’ll probably lose many of the rocks you throw, and you’ll often get the chance to throw more than once. A squirrel in a tree will give you plenty of opportunities. Select rocks that feel right in your hand with sufficient weight to deliver a knockout blow, but not too heavy to throw accurately and with some distance. Like all primitive weapons, practice makes perfect, so set up a few simple targets and assess your skill and need for practice. It sounds exotic, but this is nothing more than a short length of a tree branch that has been sharpened to a point. It’s not intended for dispatching any wounded animal with teeth, but it is easily carried in your belt for a quick stab to a slow-moving animal like a turtle, frog or non-poisonous snake. A caveman wouldn’t leave the cave without it. A club is a great close-quarter weapon for dispatching a wounded or stunned animal, or for a quick kill on slow-moving prey. They also come in handy for wild and aggressive turkeys in early Spring. That’s wild turkey mating season and they will fearlessly attack you. A good baseball bat swing with a club will put the turkey on the spit over your fire. Clubs are usually 3 to 4 feet in length and taper towards the end with the slimmer part in the hands. Roots make great clubs if you can find one with a knobby end and a thin root emerging along the length down to your hands (for a better grip). They’re not just for throwing anymore. Spears are typically as long as the hunter is tall, as straight as possible, and the points are hardened and re-sharpened after repeated heating of the tip in a fire. The use of fire to build a layer of charcoal on the tip also gives you the opportunity to sharpen your spear with the edge of a sharp rock if you don’t have a knife. Spears were mostly used as stabbing weapons that allowed some distance between the hunter and prey, and when the opportunity presented itself, they were thrown at game. An Atlatl is a spear on steroids. It consists of two parts: the spear, and a lever about a foot to two feet in length with a notched end to fit into the base of the spear. The spear is thrown, and the lever is gripped and thrust forward to further propel the spear. It’s essentially used to add inertia or speed when the spear is thrown. This not only increased the distance of any throw but added penetration power in order to cripple or kill game. The Bola is a primitive, South American invention. It is essentially two rocks tied to the ends of a strip of leather about 4 feet long. The bola is held by the center of the leather strap and the rocks are twirled over the hunter’s head and thrown at the legs of game like deer, antelope or large birds like cranes, storks or herons. The rocks and the leather strap trip up and occasionally break the legs of the animal, allowing the hunter to close in and finish it off at close quarters with a club, spear or dagger. You don’t have to be David to take on Goliath with a sling, but it helps. A sling is a small patch of leather or fabric that usually had two thin strips of leather tied to either side of the patch. A stone was put into the patch and the two leather lengths were held in one hand and the stone was swung in a circular motion. Releasing one of the straps hurtled the stone at great speed towards the target. The sling requires quite a bit of practice for accuracy, but it will hurtle a rock much faster and easier than any stone thrown by hand. 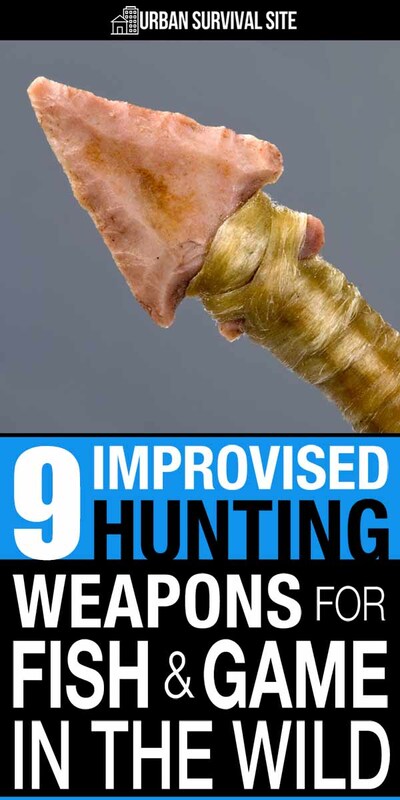 This was particularly important for any game up a tree that would require extra effort from any hunter repeatedly hurling rocks straight up at a squirrel or bird. A Gig is a customized spear with two or three sharpened prongs at the end that often have barbs carved into the tips. Gigs are usually used for hunting frogs but will also work for hunting crawfish, small fish, field mice and small snakes. It’s not easy to put together an effective bow and arrow from natural materials in a survival situation. For one, it takes a lot of time. Two, you need to find the right natural materials. The best trees for making a bow include the Osage Orange and Willow tree branches. They have a natural springiness but are strong enough to give you a good bend in the bow. Leather shoelaces can serve as a good string for the bow or you can embark on the tedious process of braiding a string from natural fibers. The Burdock plant has sinewy fibers in its stalk that could be strong enough to withstand the stress of stretching and firing an arrow if braided properly. Any arrow should be as straight as possible with a tip sharpened and reheated in a fire. Bird feathers can be stripped on one side of the vane and affixed to the notched end of the arrow with some grasses or pine sap. A quiver can be improvised from some birchbark or pine bark as well. It helps if you’re an accomplished archer, but with a little practice, you might get lucky if you come across some larger birds like ducks and geese on the water. You may even have some luck with a squirrel or rabbit. Here again, you’ll probably only wound the animal giving you some brief time to close in for the kill with your club or spear. Pygmy tribes in Africa used a secretion from a frog actually referred to as the “poison dart” frog. It’s unlikely you’ll find one, but poisons abound in the wild. The berries of Deadly Nightshade or “Belladonna” produce a potent poison that can be very carefully smeared on the tips of arrows or spears to add a lethal effect to a weapon. Be careful here and don’t eat any meat from the wounded area. It could also take time for the poison to take effect, depending on the size of the animal and the dose. A squirrel up a tree struck by a poisoned arrow will eventually fall to the ground as well as possums and raccoons up a tree. That’s up to you. Your first priority should be to assemble a good selection of rocks, improvise a dagger, Gig, and spear and find a decent club. As time goes on, you can get more ambitious and try to improvise an Atlatl, sling, bola or even a bow and arrow. 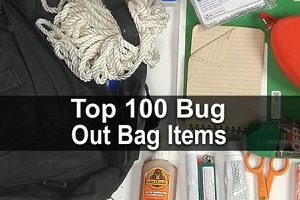 Carry them with you as you travel, and if you are working from a short-term fixed camp, just bring along the appropriate weapons for your hunting forays. Don’t forget to do some wild foraging for plants, fruits, and other food sources while you’re on the hunt. The idea is to eat, and having knowledge, experience, and a decent selection of improvised weapons can help you get through a rough time. With any luck, you’ll eat quite well and enjoy it too. Good, informative article, I enjoyed reading it. However, I would recommend a touch more research. The “poison dart frog” is indigenous to Central and South America, not Africa, as stated. However, there very well might be a species of frog in Africa, that is similar. The skin secretions that are so very deadly are a result of the type of food that the frog consumes. In the Amazon Basin, there are several different types of frogs that are known as “Poison Dart Frogs” and used by the indigenous people as stated in the article. They are characterized by brilliant skin tones, reds, yellows, and even a bright blue frog that is uncommonly lethal. Most are very small, usually from 1 to 2 inches in length (2.5 cm. to 5 cm.). I had the opportunity to live for a period of years with the Black Caiman band of the Jivaro tribe, part of the Shaur nation in the Amazon basin, and it was one of the most profound and spiritual experiences of my life. 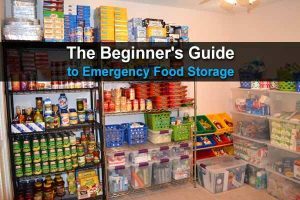 Thank you for presenting these articles to assist in being prepared for what most certainly is to come. Also, a more efficient bola is one with three weights, tethered together equidistant from the center. The length of each “leg” was about 2.5 to 3.0 feet, and with some practice, is a most valuable hunting weapon, especially for grouse and quail that tend to rise as a flock. again, my thanks for the work you do.